Sometimes, a writer has a muse. I happen to have a few — four to be specific — and I thought it might be fun to introduce them to you. First, there are Jake and Ryan. They hang out on a pink Barbie couch on my desk….along with Bella. Originally, it was just the two guys, but then my daughter thought the guys needed a friend and Bella joined the couch. I tend to have a lot of dark-haired heroes in my books. Perhaps that’s Jake and Ryan’s doing. Though in my latest book, All In with the Duke, I bucked that trend. One of the heroes – Tristan – is a ginger-blond. Umm…I need a ginger-blond boy Barbie now. Then there are the princes – Prince Phillip #2 and Prince Siegfried—who hang out on a shelf above my desk. I adore their formal attire (complete with boots, though neither unfortunately is wearing a cravat), just as I adore Regency men’s attire. If I could find a Regency Ken doll, I’d be such a happy girl. But until then, I have Phillip and Siegfried. They aren’t allowed out on the desk, though. They’ve stayed in their boxes—I don’t want them to meet the same fate as Price Phillip #1 and the Prince. Kidlet got a hold of the first princes. Their clothes disappeared, then they disappeared into the nekkid Barbie bin, never to be seen again. At least they were together. As a kid, I had only one Ken doll (yes, I was very deprived). Shortly after I got him, he lost his pants. And his shirt. All he had to wear was a maroon velvet smoking jacket. So that’s what he wore while hanging with the Barbies in the town house. I don’t think he minded. Did you have a Ken doll as a kid? Did he manage to keep his clothes on? 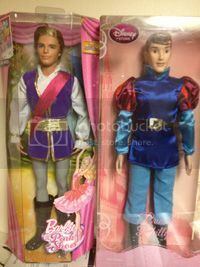 …or maybe that was just my Ken, and the first princes, who had that particular problem. « Out of the drawing room and into. . . the Alps?